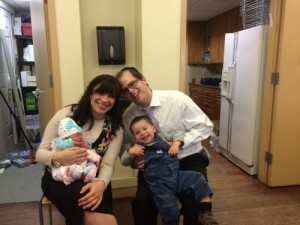 Rabbi Yaakov and Racheli Taubes arrived at University of Pennsylvania in the Summer of 2014! Along with their two children, Yisrael and Tikva they are enjoying the opportunity to learn with students and be a meaningful part of their lives on campus! Rabbi Yaakov Taubes is a 3rd generation Teaneck resident (and proud of it!). He studied for two years in Kerem B’Yavneh (KBY) before attending YU where he earned his BA in History and Jewish Studies. Following college, Yaakov was a Presidential Fellow working part time in the Office of the Dean at the Rabbi Isaac Elchanan Theological Seminary (RIETS) while simultaneously studying there for semicha (rabbinic ordination). After completing the fellowship, Yaakov continued to work for the RIETS office where he directed programming and other administrative responsibilities including running the 2014 Chag HaSemikha. He completed his Masters Degree in Medieval Jewish History from the Bernard Revel Graduate School of Jewish Studies and is currently working on his doctorate in the same field. He is also a gabbai with over seven years of experience in the field. Yaakov is an avid reader with interests ranging from bottled water, to American presidents, to the early history of the State of Israel. He also enjoys running and has completed a number of half marathons. He is the proud father of Yisrael and Tikva! Racheli Taubes grew up in Brooklyn, New York. She studied for a year in Israel at Michlalah before attending Stern College for Women, where she majored in Jewish Education and minored in chemistry. She was in the first cohort of the Legacy Heritage Jewish Educators Program, a program that trains Jewish educators through courses in education, psychology and Judaic studies, as well as intensive fieldwork in classroom settings. She also holds a Master’s Degree in Jewish Education from the Azrieli Graduate School of Jewish Education and Administration and a Master’s Degree in Bible from the Bernard Revel Graduate School of Jewish Studies. Post graduation from college, she worked at the Institute for University-School Partnership as a YU Presidential Fellow, which gave her a holistic approach to Jewish education. After that she taught middle school Judaic Studies at Yeshivat Noam Middle School in Paramus, NJ and Torah Academy of Philadelphia. She is also currently a fellow in Nishmat’s Miriam Glaubach Center’s U.S. Yoatzot Halacha Fellows Program. She enjoys living on campus, singing, reading and drawing with her two children, Yisrael and Tikki.